Trying to choose a luau for your Kauai vacation? This article includes all the information you need to know about choosing a Kauai luau – from prices to schedules to reviews. This article is intended to help you choose the best option to fit your budget, vacation schedule and location. For simplicity and ease of scanning, we are only listing the starting price for an adult luau ticket. In many cases there are options for upgrading for more amenities and better seating. Some luaus also offer an option to skip the buffet and watch the show only. On Kauai, you’ll find a nice assortment of settings from oceanfront to plantation garden settings. Kauai luaus are situated near all the major resort areas. I’ll arrange the luau listings geographically starting in the north and working our way south. Nights: Limited July, August and December dates. Price Includes: Dinner, drinks, and hula and chant show. Nights: Mondays, Wednesdays, Fridays always. During summer months, the luau is also open on Tuesdays and Thursdays. Check their website for their current schedule. Prices: Adult pricing starts at $98. Price Includes: Shell lei, tour of gardens, buffet, drinks, Polynesian show and tax. For visitors staying in the Wailua area hotels and condos, complimentary shuttle service is available. Location/Setting: Plantation garden setting. See this link for directions. Price Includes: Buffet, open bar, hula and Polynesian show. For Reservations: Book online here. Location/Setting: Oceanfront grounds of the Courtyard Kauai Coconut Beach in Kapaa. Price Includes: Buffet, open bar, Polynesian show. Location/Setting: On Grand Hyatt Kauai lawn with oceanview. Price Includes: Buffet, open bar, lei, Polynesian show. Nights: Mondays and Thursdays. Additional days may be added in summer and for holidays. Additional Information: Auli’i Luau website and hotel’s website information. All prices and times were accurate at the time this article was most recently updated January 2018. As luaus periodically change dates and prices, please verify current times, days, and prices. If you’ve never been to a luau, you’ll want to read our guide of what to expect at a Hawaiian luau. If a luau doesn’t fit in your travel budget, then catch a free hula show and Hawaiian entertainment. Have you been to any of these Kauai luaus? What did you think? I haven’t gone to a luau in ages. I really should take the kids. They would love it! 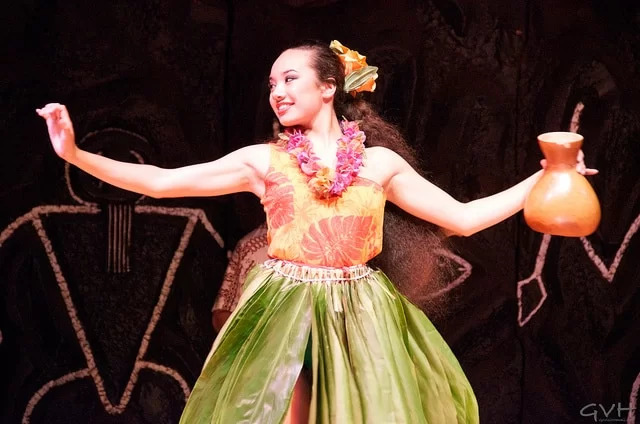 Hi Kailani – I bet your girls would enjoy the hula and Polynesian dancing and watching Samoan fireknife dancing never gets old. If you do take your girls, I’d love to hear what you all think about it. Hi! What do you think about Luau Makaiwa on the East Shore? It seems to be fairly new and doesn’t get mentioned in sites like this, but the reviews are quite good. It must be fairly new as we’ve never heard of it. We will be spending a week in Oahu and a week in Kauai and would like to go to a luau. Wondering if they are better on one Island over the other? Some of the Oahu luaus are offered at least 6 nights per week and their productions are generally larger. Thanks Sheila. I think we’ve decided on PCC Luau and will make a day of it. Great site by the way ! Good choice! Their evening show HA Breath of Life is excellent. Hi Sheila, first of all, let me say thank you for this wonderful site! I have never been to Hawaii, but you make me want to visit them all! Unfortunately, that isn’t a reality in one trip, so my husband and I are looking at going to Oahu for a couple days (Pearl Harbor is the only thing that is really of importance, some of the other scenic/historical places look nice and we may squeeze them in), and then on to Kauai for the remainder of our 1.5 weeks. In your opinion, which island has the better luaus? We are still unsure if we want to make this a family vacation and take our 4 kiddos, who will range in ages of 5-17 at the time of our trip, or if this will be a trip without the tag-a-longs 🙂 Thanks for the info!